Please check the Media Kit for full details and pricing. Honi Soit has been published by the Students’ Representative Council, University of Sydney since 1929 and has a proud reputation of being the most vibrant and prestigious student publication in Australia. It has an illustrious alumni of student editors who have gone on to become well known faces in the media and in pubic life. Honi Soit is a tabloid sized weekly, produced during semesters (27 editions per year), the only weekly student newspaper in Australia. It has a print run of 3,000 distributed free at over 62 locations on Sydney University campuses including main campus, Faculty of Nursing, Camperdown; Sydney College of the Arts, Rozelle; Conservatorium of Music, and Cumberland College of Health Sciences. This includes newspaper stands in foyers, cafes, faculty desks and libraries. There are over 45,000 students and nearly 10,000 staff at Sydney University. Honi Soit offers an exciting opportunity for you to capture the undergraduate and postgraduate student markets. University students represent a lucrative potential market: they are high discretionary spenders, and are an important force in the youth market. 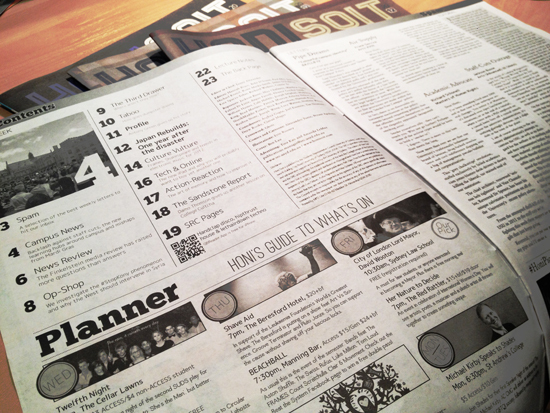 Honi Soit is also online! (Average UV’s per edition: 11,000 and up to 33,000). Print display ads will feature in an online e-book of the print edition, published on our website in addition to the printed copies. ALSO: leaderboard web banner ads (728x90px or 970x90px) are available. Your ad will feature at the top of every page of the site and be displayed exclusively for 1 full week, including click through to your site. We post feature articles and breaking news approximately 3 times each week and link through to the website. Print advertisements: 300dpi, CMYK colour. File formats accepted: PDF or TIFF. Artwork to be supplied via email by 2pm on ad deadline date. Web banner advertisements: 72dpi, RGB colour. File formats accepted: JPEG, PNG or GIF. Artwork to be supplied via email by 2pm on ad deadline date. Files will be placed in Honi Soit as supplied. Any errors in preparation or content are the advertisers responsibility. Additional artwork preparation fees will apply if adjustments are required. By supplying us with a hard copy proof of your ad you make it possible for us to prevent any errors before print. Without it, we can’t accept any responsibility.